We probably haven’t met in "real life" yet but ask anyone who has met me and they’ll tell you I’m the girl who’s always smiling and giving out hugs like free kittens. They might also tell you I’m a little silly and playful: I wear puppets for mittens. I dance in the aisles of Whole Foods. 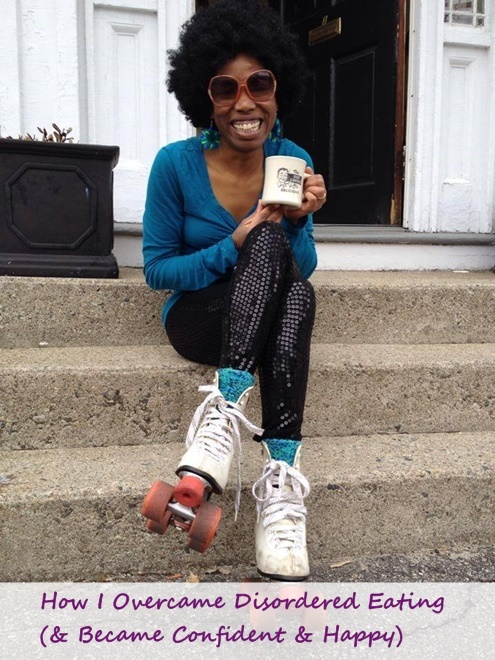 I drink coffee while doing roller disco. I play ping pong with strangers. I'm full of confidence and truly enjoy life, but I didn’t always feel this way. I once struggled with anxiety, depression, insecurity, and low self esteem. I used food to manage these feelings. I’m not sure when it all began but when I was three, my whole world changed. After a fun family night out, we came home to discover our apartment was destroyed in a fire and we became homeless. My parents separated. My older sister was sent to live with her grandmother. My mom and I lived in a shelter. Though soon we found a new home, the experience left me scarred. I believed bad things happened if I had more fun than I deserved. I spent most of my childhood anxiously playing small- trying to be good enough, but not so good that I drew attention to myself or seemed like I thought I was special. I never told Santa what I really wanted for Christmas. I studied hard and was consistently on the Honor Roll but I’d quickly stuff the certificate into my bookbag and out of sight. I never celebrated any personal victories. When I was sixteen my father died of cancer. At the same time, my relationship with my mom was stressed because of her anxiety and depression. My late-blooming body was becoming curvier and the attention it was getting made me self-conscious and uncomfortable. My life felt completely out of control. I started dieting. My intentions were to just lose a few pounds, but soon it evolved into an obsession with my weight and controlling food. Focusing on calories, fasts, laxatives, and food combining was a welcome distraction from the anxiety, depression, and grief I didn’t know what to do with. It was a relief to have a problem that was easy to identify and seemed solvable. I believed if I got below 100 lbs I’d be happy and my life would be perfect. I’d weigh myself a few times a day and all my self-esteem came from whether the number on my scale went up or down. Of course, by the time I weighed 99 lbs my life was more miserable but I didn’t know how I could be happy any other way than losing more weight. Fasting for days, then hiding in my dorm room to cry and wolf down a whole Entenmann's cake alone and puke it up was my usual routine. I slept most of the time hoping life would pass by sooner. I felt like I was disappearing. I wished I really could. I didn’t just control food to escape. There was also lots of drinking and lots of random drunken hook-ups. I was constantly looking for ways to numb my emotions. Things didn’t get better until they got worse. At 19, I found myself pregnant. I decided to have an abortion, but the experience connected me with a part of myself that wanted to live. It awakened the long dormant part of me that knew there was something more to life than just avoiding punishment and pain. I had no clue what that “something more to life” was so I just tried to get closer to it. I gave myself permission to let my desire guide me. I pursued people, places, and experiences that interested me. I made art. I made love. I made pancakes! Gradually, I gained the confidence in myself-- the self that I am when I take away my gender, race, class, and even my quirky sock collection. I gained confidence in the part of myself that is a powerful creator of my circumstances, the part that some might call God or Universe or Source. I didn’t call it anything. I just felt it and trusted it. In doing so, the need to be small and numb was replaced with the courage to experience all the feelings of being alive, even the uncomfortable ones. I don’t run from my feelings anymore. I pray with them. I look at them. I ask them questions. I hold their hand. I take them dancing. I give them crayons. Most importantly, I know I am not them. I am so much greater than my feelings. We all are. It’s been a long journey and I am far from having everything figured out (if that’s even possible) but I love being myself. I know I’m beautiful no matter what I see in the mirror. I haven’t weighed myself in years. I’m totally comfortable being alone. I’m just as at ease being myself around others. Today I’m always smiling because that’s a transformation I’m willing to celebrate! My mission now, as a health coach and (internet or "real life") friend, is to help women kick low self-esteem to the curb and put out the welcome mat for a hot body, unlimited confidence, and unbridled joy. I share all of this with you because these experiences made me the strong confident happy person I am today. I know that no matter where you are on your unique journey the same is possible for you.